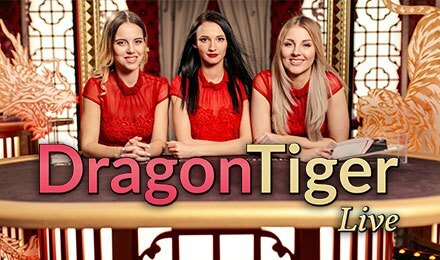 Live Dragon Tiger Baccarat powered by Evolution Gaming, is a swift and enjoyable Baccarat variant now available to play at Wicked Jackpots! The game takes place in a unique setting, specially designed for Live Dragon Tiger! The twist with this version is that it plays super-fast, where one round can only last 25 seconds! Live Dragon Tiger starts after you have set your bets. Then, the dealer proceeds to deal only two cards; the dragon and the tiger. Start betting on the cards which you think will have the highest values. The Suited Tie Bets are optional bets on the Dragon and Tiger cards that are equal in both rank and suit. In the event of a Suited Tie Bet, half of the players Main Bet is returned and a payout of 50:1 is awarded. Tie Bets are voluntary side bets on either of the two cards being equal in its value, irrespective of the suit. Having a tie bet in the game during a Tie Bet gives you half of your main bet. Also, seize 11:1 during the Tie Bet. Live Dragon Tiger is an amazing Baccarat variant, and perfect in every way! Now you can launch it on your mobile, desktop or tablet and enjoy!